Is there a kayak / paddleboard for large people? I am a very large man - I am 6'4" and weigh 450 pounds (I've lost a 100 pounds in the last year). I bike or walk everyday, (and swim laps occasionally) but want to add another sport to my exercise routine. I live in a gated community with 5 lakes - so I have a lot of places to go just outside my door. Does anyone know of a good resource to find a kayak or paddle board for large people? Are you a large person already been down this path? I really haven't seen anything out there - I assume most people my size really don't do such things - but I can swim over a mile nonstop now so I have no fear of getting out on the water. The open design means there is no cramped compartment to fit into. This particular tandem claims a capacity of 500 pounds. I assume some modification would be required to make it a centered single seat. I am also a paddler on the heavy side. You might check out the 14 foot Native Watercraft Ultimate. Is comes as a tandem, but a single seat can be mounted in the middle and the other removed. It is very stable and pretty agile for its size and hull shape. It is rated to 450 pounds. You might also look at the 14ft versions of the wilderness system tarpon and lingo models. Both paddle nicely and are very high quality boats. I suggest them highly. If there is an independent dealer in your area you should give them a call and ask if they will let you demo a few boats. Most good shops will. Stay away from the chain store boats. An answer from the paddle board side. I've seen paddle boards up to 400lb among the casually available, generally among the longer (and wider) of the selections, like 12-14 feet or more. With some looking online, I found one that is rated to 450, another for 430, intended for tandem paddle boarding. One more was rated to 700. 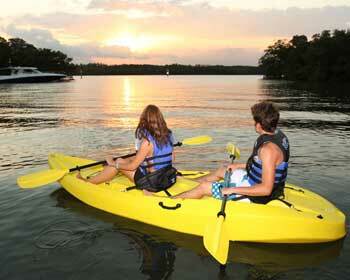 There are also group paddle boards, the first link mentions one rated to 1050. Note that this would be very large and likely difficult to maneuver. Searches for tandem or family sized paddle boards may unearth others. On the personal side, I took a paddle boarding lesson some months ago and tried several boards... looking at the average capacities vs lengths now, at least some of the boards I tried must have had official capacities considerably under (100lbs or more under) my actual weight. I had no real trouble with any of them, though I did prefer the longer and wider among the boards. It may be relevant that I didn't stand up to paddle board, I was kneeling and sitting on each one I tried - I mention this because difficulty balancing is one of the cited problems with overloading a paddle board, though my own balance is poor enough I can't say if that was the reason. It may also be worth noting that weight and weight capacities were not discussed when signing up for lessons, contrasted to kayaking which both noted some restrictions when signing up and considered capacity when choosing a kayak. Also, I had quite severe problems balancing and maneuvering while kayaking (probably I was close to or a bit over the capacity), while the paddle boards were quite workable and stable enough I would have had no concerns about adding weight (in the form of gear) even though I must have been, again, nearly at to slightly above intended capacity. The reason for this somewhat long-winded anecdote is, you may be able to look for lessons or rentals on boards even somewhat below the recommended weight capacity, as long as you can account for the lesser stability (in my case, by sitting or kneeling instead of standing). This might work to see if you would even be interested, and you can look for one with the right weight capacity after you know it will be worth it for you. Malibu x-factor, etc. I clock in at 395--no problem. They have several high capacity boats. I'm a fairly heavy man myself though not quite as tall. Weight has always been my problems with recreation boats. You might want to look at sport canoes. They are also open designs but can typically hold more weight than a kayak. Not the answer you're looking for? Browse other questions tagged kayaks or ask your own question. Plastic or fiberglass for a kayak? Is there a difference in performance between a fishing kayak and touring kayak? What is a “stitch-and-glue” kayak? What is the best way to transport a kayak? White-water (slalom) kayak in calm waters (lake)? Roof rack system suitable for both bicycle and kayak? What equipment do I need for a 5 days kayak journey in the Mediterranean Sea? Kayak for fishing and low class rapids?